A new generation of entrepreneurs is emerging to refashion the Los Angeles studio system for the digital age, forming companies that combine live-streamed video, podcasts and the newfound social media celebrities to craft entertainment for a new breed of consumer. Two of those startup founders, longtime Apple executive Cedric Rogers and former developer for VEVO and MLB digital Shaun Newsum, are now pulling the curtains back on the first fruit of their production studio, Culture Genesis, with the launch of TriviaMob — a new quiz show targeting urban audiences. The two creators envision their company as a combination of 106 & Park and Jeopardy with questions aimed at cultural references for the Highsnobiety and Complex set. 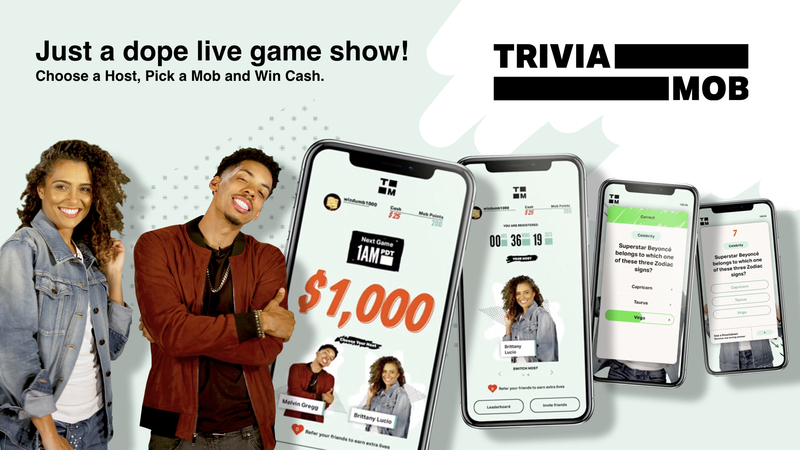 TriviaMob players can win up to $10,000 in cash by competing individually or as part of a group (or “mob”) to win collective prizes by tuning in and competing to shows that stream every Sunday. Each player has 10 seconds to answer 10 questions around art, music, science and history. Players that answer all of the questions correctly will get a share of the $10,000 prize and participants who opt to be part of the “mob” can earn points for sponsored prizes. For its foray into live-streamed appointment entertainment, Culture Genesis has tapped Melvin Gregg, the influencer and star of Netflix’s American Vandal series along with a host of… well… hosts, including former Miss USA contestant, Brittany Lucio; DJ Damage, the co-host of Sean “P. Diddy” Combs’ flagship show, REVOLT Live; Jessica Flores; and TV host and comedic actress Dariany Santana. Backed initially by Los Angeles-based accelerator MuckerLab and Betaworks’ latest LiveCamp program, the two founders see Culture Genesis as tapping into the twin trends of gaming and mobile technology adoption in young African American and Latinx communities. The founders cite statistics indicating that 73 percent of African Americans and 72 percent of Latinx consumers over 13 years old identify as gamers. The business model mimics that of HQ Trivia, the once-popular quiz show whose success has waned even as it scored massive gains in venture fundraising — valuing the company at a reported $100 million. PicoBrew is a beer-centered startup in Seattle, founded by brothers Bill and Jim Mitchell and Avi Geiger. The machine at the heart of their operation is The Zymatic—an apparatus that simplifies beer-making by reducing the need to monitor the cooking process of creating Wort (unfermented beer).